When Carrie asked me to be a part of her book club as a host, choosing a book was easy. I have wanted to read The Adventures of Tom Sawyer for a long time; in fact, I have actually intended to read it every year for the past several years, but it always gets pushed to the bottom of the stack because as much as I wanted to read it, there’s always something else that’s just slightly more interesting or urgent. That I haven’t read it or The Adventures of Huckleberry Finn has always been a source of mild embarrassment, made more acute by the fact that I have a degree in English education and have almost enough graduate English credit hours to have a master’s degree. I taught high school English, for Pete’s sake! Still, somehow in all my education, no one ever forced me to read this one, and since I’ve only lately begun to force myself to make reading selections based on anything but absolute necessity, sheer pleasure, or morbid curiosity, my knowledge of the American literary canon had some gaping holes. I’m happy now to say that I’ve closed one of these more noticeable gaps, and I enjoyed doing it. There’s a quote by Charles Dudley Weaver from a December 1876 issue of the Hartford Daily Courant on the back of my paperback copy of the book. It says, “The book is full of quotable things. . . but it is unnecessary to quote from a book which everybody will read.” That sums up how I feel about anything I could possibly say about this book. I feel like it’s a joke that everyone has already hee-hawed over, only I’m itching to share it with someone. You’ll excuse me, then, if what I say here seems rather elementary. First, I had built this book up in my mind to be something that it isn’t at all. I think after years of laboring through obtuse minor works of literature, I expected this one to be hard to understand and complicated, but is neither. Why didn’t we read this, then, instead of something like S.E. Hinton’s The Outsiders way back in seventh grade? I have nothing against The Outsiders at all, but Tom and Huck are definitely more important cultural icons than Pony Boy and Johnny. I suspect that as a college-bound, Advanced Placement-taking high school English student, I was supposed to have read this at some other point in my education, but I didn’t. Second, I kept thinking while reading this story that it’s really nothing more than the story of a boy’s life and experiences. It’s not really different from many, many other children’s stories that I’ve read. 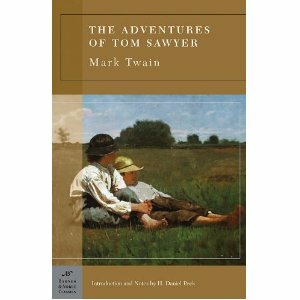 Stories like Understood Betsy (linked to my review), Hans Brinker (link), and Caddie Woodlawn come to mind, with the obvious difference being that Mark Twain makes Tom and his friends “normal” boys instead of paragons of virtue. (I know that comparing books about girls and books about boys in this era especially is comparing the proverbial apples and oranges, but I happen to have read far more books about girls than boys, so that’s what comes to my mind.) Tom Sawyer really is just a coming-of-age story, something that you’re very apt to find if you browse the middle grade section at your local bookstore or library. Something in me asks what makes it so, well, special in the face of so many similar tales, but I do have the perspective of time and familiarity. Thank you, Amy, for hosting this month! 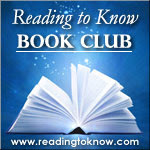 June's book club selection is A Girl of the Limberlost and the conversation will be hosted by Stephanie at Simple Things. We hope you will join in! Thank you, Carrie, for allowing me to host this month. I had a great time with this book! Amy, I'm glad you chose this book because it was the perfect "visit with an old friend" I needed this month. I have to admit I'm surprised you had never read it (what IS our educational system coming to?!) and I certainly hope you get to continue your acquaintance with Huck Finn this summer. :D (Please don't think I'm mocking you--I have severe gaps in my education as well which I am trying to fill, such as my recent reading of Crime and Punishment and the upcoming Girl of the Limberlost--I just am surprised Mark Twain isn't required reading). Thanks Carrie and Amy for a great read! Amy, thanks so much for hosting! As I mentioned in my review of it, it was not a read I was looking forward to but I grew to like and appreciate it more. As you say, Tom is like many other stories of children and their growing up experiences. I think I liked Tom more this time 'round because I read the introduction in which Twain says Tom is a composite of three different boys he knew growing up. Somehow this helped me as it felt more like Tom couldn't have possibly gotten into so much trouble as one individual person. :D At any rate, I really appreciated the opportunity to re-read it. And a note to all - Amy had formatted her post in a way that my computer failed to recognize. (It should have been easy for me to figure but for User Issues. ;) If you notice something funky in the format of the post, blame me and not Amy. Carrie, you're right--I thought the same thing, that there's no way one mischievous boy could get into so much trouble! Both Shonya and Alice do a good job of discussing how Twain uses Tom Sawyer to show a "real" boy, one who acts rashly but also has a conscience. While reading along, I discovered that I also managed to miss this one during my growing up years. I think I may have overemphasized in my review how much Tom's naughtiness turned me off. Really, I very much enjoyed reading this one--thanks Amy! I'm finally linking up again! An easy read, though I didn't love it, I did enjoy it and am glad to have read it!